A couple of people had trouble recreating my sample gadget and it turns out that the issue was with the HTML file I posted. 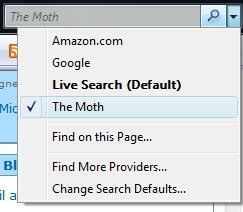 In IE7 when right clicking on the link and selecting "Save As", the dialog that comes up saves it as HTM. This of course will not work since the manifest file that you download points to an HTML file, not an HTM file. So please rename the file to its full extension after downloading. Note to self: always upload HTM files rather than HTML files to help IE7's "issue". Well, not just yet but this month none the less. Everyone will receive Internet Explorer 7.0 via Windows Update (after they accept the EULA). I am not a web dev so I just see this from an end-user's perspective. I have switched to IE7 for a while now. You may think "Yeah, since you can't run IE6 side by side with IE7, obviously you have switched in order to dogfood IE7". Well, yes that is true, but to be perfectly honest with you, I meant that I switched from Firefox. That's right, I am one of the crowds that switched from IE to Firefox just over a year ago and now I have switched back (with my only gripe being no free ad-blocker out of the box, but I might be tempted by an add-on). The main thing firefox gave me is now present in IE7: Tabbed browsing (and it is done a lot better IMO with closing/newing/previewing hitting the sweet spot). The other thing, which is quite significant, is that IE7 just seems a lot faster (I wonder if someone can prove that for me please, I just know it is true). Of course, there are websites out there doing stupid things like checking if they recognise the browser. In other words, an idiotic person wrote code that says "I explicitly recognise IE6 and support it, but anything else that will come in the future I will just not render and give out a silly message". As you can probably tell by the emotion in my statement, I have been dealing with such a 3rd party crap website to order my company car... anyway... if you are in that scenario too, you can always spoof the website by using this user agent tool (even more useful on Vista where there seems to be no way to remove IE7+). Bottom line... try IE7 if you haven't already... you will like it (screenshot in my previous blog post). I hate to make all this sound like an advert, but see it as my way of saying "thank you" to the IE team for a product I genuinely like! If you followed the links from my Windows RSS Platform blog entry, you will have found the infamous example of using the RSS API to create a screensaver. In that same MSDN area from the treeview on the left you can find the RSS object model reference. The RSS API allows browsing the feed hierarchy, add/edit/delete the hierarchy, listening for events to changes in the hierarchy and controlling the process of synching/downloading. Please see my blog post with a short example of utilising managed code for using the RSS API (skip to the code section and keep it in mind while reading the following). What I want to do here is provide some tips for when you start using the RSS API. 3. 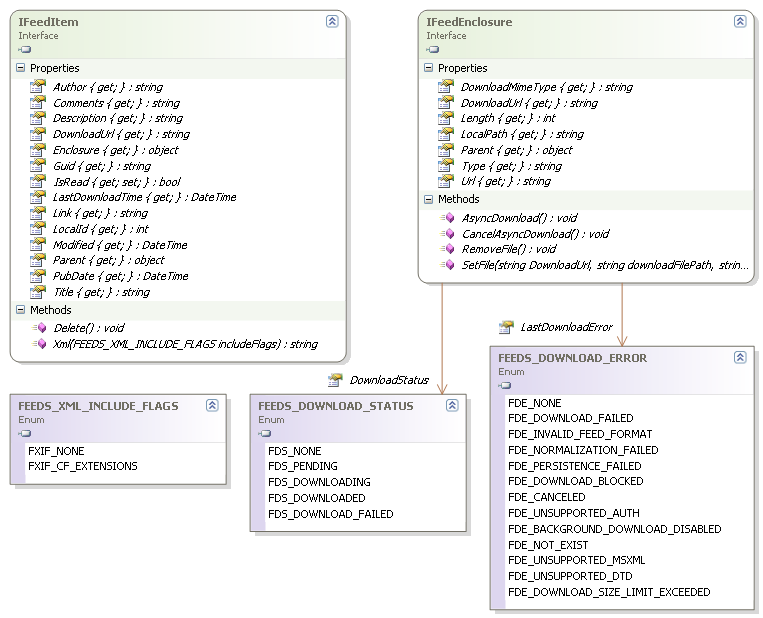 Everything starts with the FeedsManager and his RootFolder property (there is always a implicit root folder). 5. 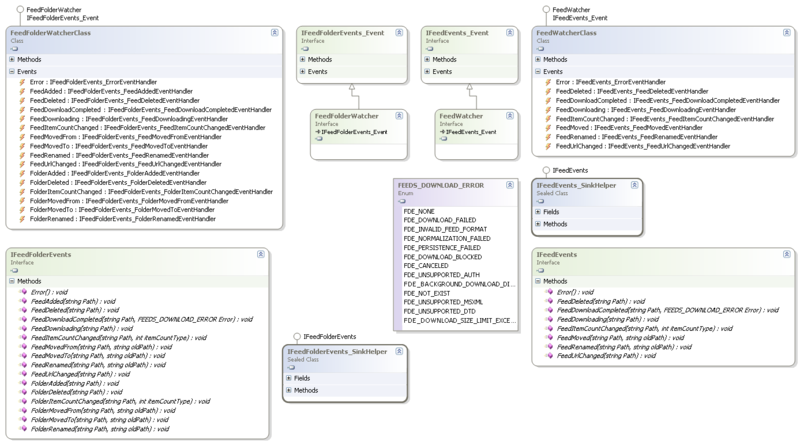 Most class/interface members return an object typed as System.Object. That means you have to do some casting in your code e.g. the Feeds and Subfolders properties in my example have to be cast to IFeedsEnum. Now go to our nuggets page and watch one (by MikeT) on how to build an RSS viewer in C# using the API. We already looked at how I deleted all the feeds in Outlook 2007 in one go, and not one by one. Luckily IE7 understands folder structures from opml but somehow I managed to get them all in a flat list in IE as well (probably outlook messed that up for me or maybe a glitch with IE7 Beta 2 that I was using or something else, not important now). So how do you delete all feeds in IE7? Out of the box you can't. 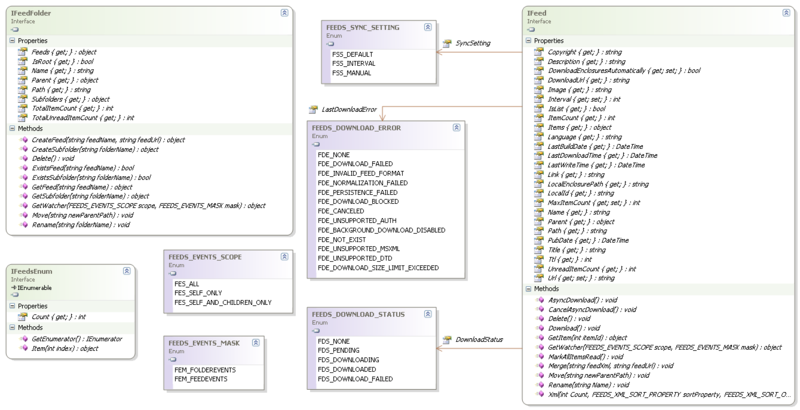 Fastest end user way would be to create a folder and drag them all in it one-by-one and then delete the folder - yuck! "[drive letter]:\Documents and Settings\[user name]\Local Settings\Application Data\Microsoft\Feeds\[your feeds and folders]"
By now you know that Outlook 12 can be an RSS aggregator. Outlook 2007 has its own RSS engine and does not fully use the Windows RSS Platform. It can share one element of the Windows RSS Platform and that is the Common Feed List. To enable this, go to 'Tools->Options->Other' and click on 'Advanced Options'. On the dialog that comes up, check the checkbox: 'Sync RSS Feeds to the System Feed List' (obvious, right? :-p). For more on outlook and RSS check out the RSS category on Michael Affronti's blog here (I think he owns the feature so you know where feedback on this has to go). While evaluating whether I want to switch from my current aggregator to the outlook12+IE7 combo, I messed up and ended up with a looong flat list of feeds in Outlook (since outlook doesn't understand folder hierarchy in opml). So I wanted to delete *all* the feeds and while I can do that one by one, there was no mechanism to just get rid of all of them in one go (no folder multiselect). In case you are wondering, even if you delete the subscriptions from outlook through the 'RSS Feeds' tab on the 'Tools->Account Settings' dialog, all the feed folders you have under the 'RSS Feeds' folder remain (kind of makes sense so you don't lose any cached content). Also note that by default the RSS subscriptions are stored on exchange (which is good because you have access to them from multiple machines through OWA, but also can be bad if your server pst size limit is small). The above worked for me so capturing it here in case it helps anyone but, again, do this at your own risk. The RSS story varies depending on whether you are a publisher, end user or consumer developer. While almost everyone I ask is an end user (via a browser or a rich client aggregator) and many are producers (most commonly blog authors like myself), very few are developers that programmatically consume RSS today. My bet is that this will change going forward with the advent of the Windows RSS Platform. The Windows RSS Platform ships with IE7 and hence is available not only with Vista but on WinXP too. Applications running on Windows have a choice as to which of these components they want to use - in other words it is not an all or nothing approach. For example IE7 uses the lot while Outlook 2007 optionally uses the Common Feed List (more on O12 later).